Hunting spiders can not only watch your every move, but they can feel those moves, and that of their prey, through the air. 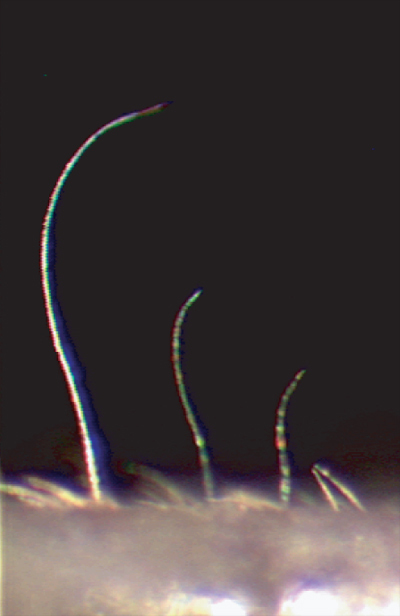 How their tiny specialized hairs do it has puzzled researchers for decades, but one team of scientists may have found a break. Their physics-focused work suggests each hair acts like a single, independent ear — not a network of ear parts that, together, turn a spider’s exoskeleton into one giant ear, as was previously assumed. “Nobody had looked at these hairs in just the right way. When you look at what they are mechanically optimized to do, you could design better ones,” said physicist Brice Bathellier of the Institute Of Molecular Pathology in Vienna, who co-authored a study of trichobothria hairs Dec. 14 in the Journal of the Royal Society Interface. Researchers in the past thought each hair acted like those found in the cochlea of the human inner ear. In that organ, a forest of different lengths and thicknesses of hair breaks up incoming sound waves into discrete chunks, rather than picking up a wide range. 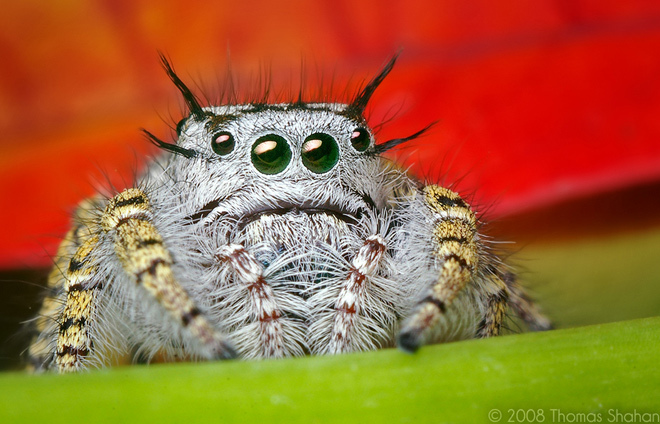 Previous experiments agreed with the assumption: Spider and insect trichobothria resonated at very specific frequencies, showing “peaks” at one particular sound frequency. But Bathellier said almost all of the research focused on the distance the sound waves wiggled the hairs back and forth — not on how fast they wiggled them. To measure the hairs’ wiggling velocities, Bathellier and his colleagues placed hunting spiders and crickets in a sealed glass box with a speaker mounted to it. Then they painted a laser sheet down the box and across a specimen’s trichobothria, then puffed microscopic drops of oil that lit up in the plane of the laser. As they tweaked the speaker’s sounds, a video camera recorded the oil particles moving around the hairs. Later, a computer program deduced the speed of the moving oil droplets around the hairs. Instead of one peak response to a single frequency, “these hairs operate at the physical limits of sensitivity across a much broader range of frequencies,” Bathellier said. The hairs responded best to sounds between about 40 Hz, a low rumble of bass, and 600 Hz, a car horn (humans ears can detect between 20 Hz and 20,000 Hz). That they picked up such a wide range of frequencies at all could overturn previous assumptions about how trichobothria work. “They operate like band-pass filters or microphones, not like the hairs in a human ear,” Bathellier said. In effect, each hair is its own ear that filters out background noise and zeroes in on biologically relevant information, such as an unwary cricket’s hopping or a spider’s sneaking. Determining how the hundreds, sometimes thousands, of arachnid “ears” work together to give a big relevant picture is next on the research team’s list.